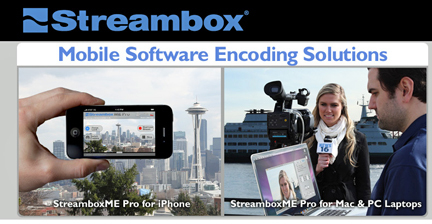 [SatNews] Streambox will be demonstrating Streambox ACT-L3 4K hardware and software, encoding and decoding, at NAB 2014. The Streambox ACT-L3 4K encoder is an adaptive bitrate encoder capable of encoding full resolution 3840 x 2160 UHD or 4096x2160 4K Cinema DCI 23.98, 24, 29.97 and 30 fps 4K videos from 4 Mbps up to 50 Mbps in realtime with currently available video equipment. The ACT-L3 Software Encoding engine is designed for multi-core encoding and utilizes all available CPU cores and is capable of encoding 50-60 fps 4K videos in realtime. The ACT-L3 4K encoder can record 4K videos to a file standalone or as it streams for Store and Forward applications. The Streambox ACT-L3 4K encoder has many advanced features including optimized 1-click presets that automate the workflow from video capture to transmission and playout. The ACT-L3 4K Encoders and Decoders support LDMP networking for reliable multi-path IP based 4K transmission over the public Internet for point-to-point 4K video contributions. For point-to-multi-point and many-to-many 4K video contributions and sharing the Streambox Enterprise Server will need to be included in the workflow. The Streambox Enterprise Server is a centralized secure server that supports LDMP networking for reliable “first” and “last mile” video transmissions from incoming to outgoing streams, it provides automated live routing based on metadata, and all videos are archived automatically for editing or for later use. The simplified 4K workflow demonstrations include capturing 4K video from Blackmagic Production Camera 4K via single thunderbolt with Macbook Pro laptop with Streambox ACT-L3 4K Software Encoder, encoding and transmitting to Mac Mini with Streambox 4K Media player, playing out on 4K monitor via a display port. The software demo includes capture, encoding, delivery and playout of live and files via dedicated Single-link 6G-SDI or HDMI hardware with Blackmagic Ultrastudio 4K with Thunderbolt 2. NAB 4K live demonstration also includes capturing, transmission and playout from ACT-L3 4K 1RU rackmount Encoder to Decoder.